Summer is slowly going to an end. I love summer for one reason. Dresses and skirts. My brown faux leather skirt goes perfectly with sheer white top. 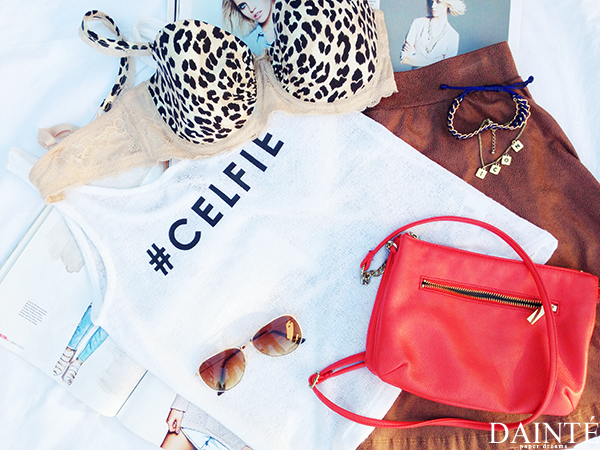 Leopard printed bra peeks under a shirt and gives a bit flirty touch to it. To make my outfit more fun I simply added vibrant red cross body bag. loving these summer items! kind of sad summer is ending, but I'm looking forward to fall! That skirt looks so great and it's perfect for fall as well as summer! Lovely pieces! I especially like the red bag! That skirt looks so nice! Must have been a great companion during summer :) But I also adore your cute jewellery!